Warrior Beat is completely free to Veterans and your donations makes that possible. Donations of all sizes are welcome and greatly appreciated. A donation of $40 or more puts a drum into the hands of a veteran at no cost to them. Warrior Beat is a non-profit organization that promotes healing, well-being, reintegration and fellowship for military veterans through professionally facilitated group drumming. 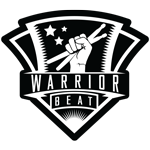 All of the Warrior Beat programs and services are free for military veterans and every veteran that joins the Warrior Beat community recieves a free Remo hand drum! Support Warrior Beat and look amazing while doing it. Check out our Merch store over here at RedBubble. Every purchase kicks back a donation to your favorite charity — Us!